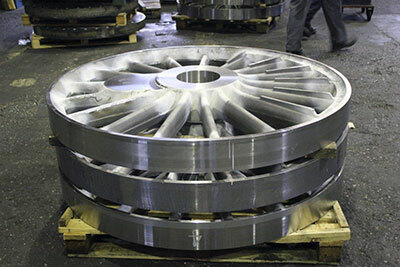 Good progress has been made by The Boro' Foundry with machining the six driving wheels. The basic plan is that the West Midlands company will finish machine the centre bores and bosses so that the wheels can be pressed straight on to the axles when they arrive at Buckfastleigh. 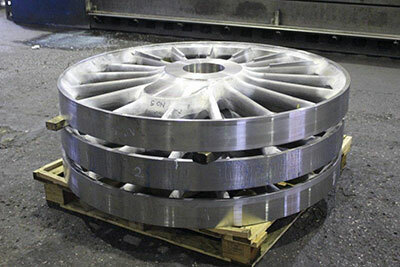 South Devon Railway Engineering will then finish machining the outer rim of the wheels and fit the tyres. They will also complete the crank pin bores and fit the crank pins. For our part at Bridgnorth we have a great deal of work to carry out on the axleboxes before they will be ready for use. This work includes machining the axlebox castings, machining and fitting the liners to the horn faces, machining and fitting the bearing crown and whitemetalling. Machining of the keeps also has to be done. We are informed that the cylinder cast from our pattern equipment for 76079 at the North Yorkshire Moors Railway has been successfully machined and will shortly be subjected to a hydraulic pressure test before being given the final thumbs up. Work continues at Bridgnorth on refitting various stretchers at the rear end of the chassis and reaming holes in preparation for riveting. We still have a small quantity of calendars available at £5.00 + £1.20 p&p. Please contact Barbara to purchase. It may seem a long, long winter away as you read this, but now is the time to note that the 2014 Annual General Meeting will be held in the upstairs Lecture Theatre at Kidderminster Railway Museum on Saturday 5th April at 2.00 p.m.
All are welcome, as ever - you don't have to be a member of the 82045 SLT (though we might try to recruit you on the day!) - and all constructive comments and suggestions will be gratefully received. We continue to raise funds for the Wheel Appeal, though now the emphasis has shifted to the pony wheels and pony assemblies as the complete driving wheel job is accounted for. We have arranged to borrow the pattern for the BR Standard three-foot pony wheel for a reasonable fee, and Tony is at present seeking quotations for the casting and machining of the four wheels as well as for the supply and fitting of the tyres for them. With the NYMR cylinder cast from our pattern for 76079 apparently successful, it will soon be time for ours to be cast by Cerdic prior to machining at the West Somerset Railway. Before this, the castings will need to be subjected to stress-relieving. Again, the complete job is accounted for. We are gearing up for the launch of the Boiler Appeal (see notes for September) in the early Spring, and Chris has designed a new appeal leaflet specifically for this. It is quite striking, so we are hoping it will have the desired effect! Two photos, taken on 23rd October 2013, showing the progress made with machining the driving wheels for 82045 by The Boro' Foundry. Photos: Peter Line. 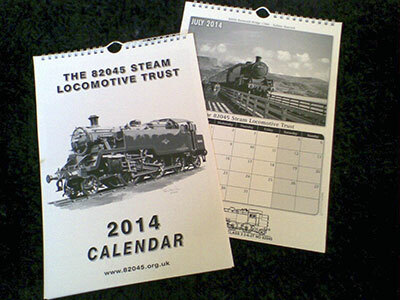 The 2014 Calendar - we still have a few available at £5.00 + £1.20 p&p.